Description: Friesian is a really beautiful horse breed. 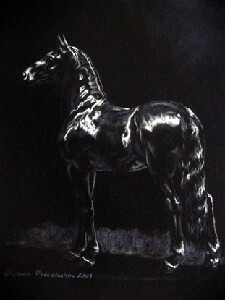 When I wanted to paint a horse listening to the sounds of the night, in my minds eye I immediately saw it as a Friesian. I did this work really quickly, almost sketching-style, to balance the many hours I had just spent doing "Patience of Time" Pastel on velour board this painting is for sale. Inquiries to the artist by email. I am a self-taught artist. I have been painting horses since I was three years old. For many years my painting remained only a hobby but then a gallerist I knew persuaded me to have my own horse art show. Reviews were kind and the word spread, horse owners started calling and ordering portraits of their horses. I use pastels, color pencils, pencils, acrylics and mixed media. I strive to paint beauty, and to me a horse is the most beautiful subject. I also take great care to paint anatomically correct horses but I also want to bring out the soul of a horse, that special spark and magic each horse has. You, the viewer, are the best judge of my success in this. And as many horse owners had other animals in their household also, I have been doing cat and dog portraits as well. Please be welcome to visit my site to see more of my work.